School is FINALLY out!! 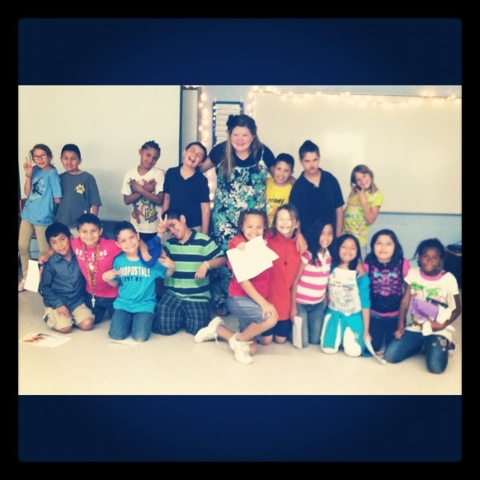 And here is a last-day picture with my third graders! It's been a fun week, though these kiddos were CRAZY. I did some TPT and Pinterest searching for activities perfect for the end of the year! called What's The Scoop? The best part of this end of the year activity is that it is FREE!! I sized down the scoops in the PDF file, and had students fill them out, color them, paste them onto a piece of construction paper. Some of the questions that the different scoops had on them included: What I learned in math is..., My favorite memory of this year is..., and some favorites. Super fun activity that will keep your kids busy during a last day of school! 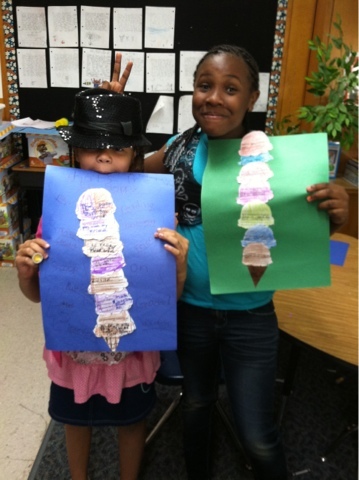 Here's a picture of a couple of my girls with their completed ice cream scoops! These girls are hard at work at task one! I made a Smartboard screen for this math task. They had to solve all of the division problems using a multiplication table (something we had been learning), and then use the answers to find the secret message. You can download the screen at Smart Exchange. 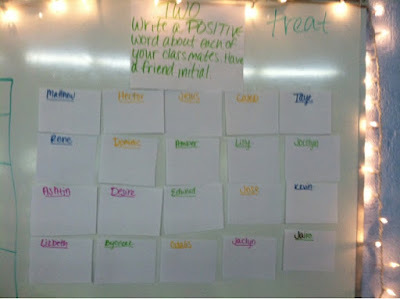 In this task, the students write a word describing each of their classmates on the card with that classmate's card. I put all of these cards up on the wall and they just write one word for each of their friends. This is a picture of what I set up. This is a task I took from Kelley's original idea. 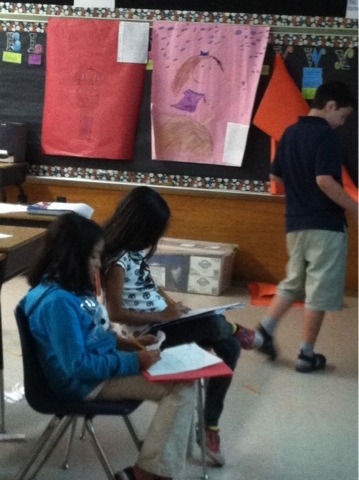 I had this task by the classroom library and my students read a favorite book from this year. Easy peasy! I made a poster for the students to write some advice for next year's third grade. This is something that is easy and that can be interchanged with anything you have in the classroom. 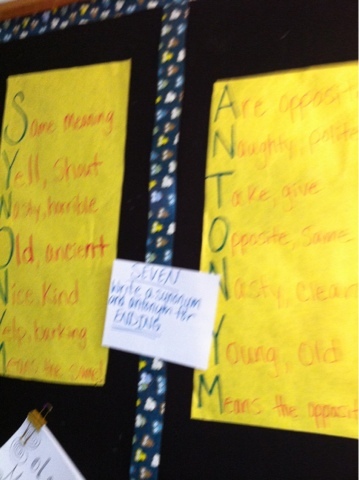 We had synonym/antonym posters, so this was a great choice! Another fun idea from Kelley! Super fun for them to have a laugh during one of their last days together. This is another one I took from Kelley, because it helps the students reflect on the year. So that was another fun part of the week! If you are still in school, I definitely advise you to check out Kelley's resource! The kids LOVE it! It is a cross between Reader's Theater and I have Who has. Each student gets 2-3 cards and all of them together describe a last day at school!! 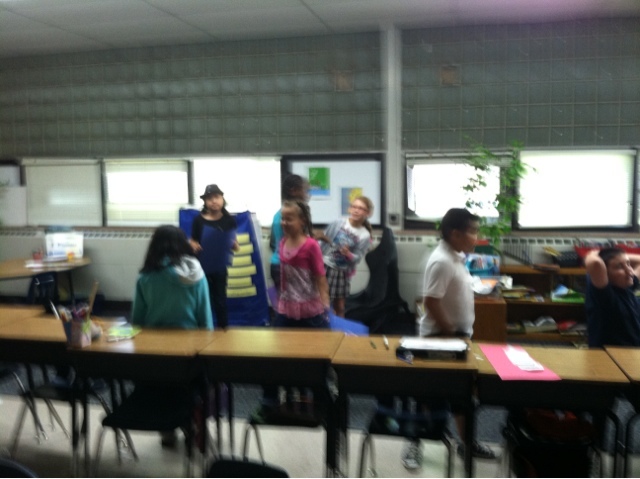 It's so much fun and my students loved it once they got into it. It's definitely worth your time! One of the other EXCITING things to announce is that I'm participating in next link up called To Be Continued!! 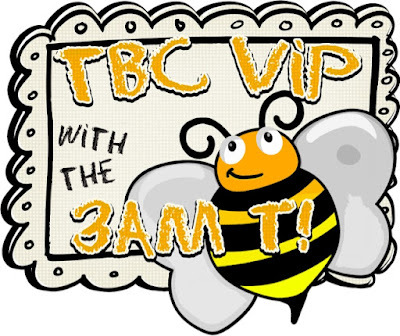 She will be giving everyone who signs up a part of this linky party. She will start a story that "will be continued" at another blog, and the story will go on and on through all the signed up bloggers!! You definitely should go to her page (via her button above) and participate!! Then you can become a TCB VIP with me!! I did that scavenger hunt activity too! It was super fun.